This page will explain how to receive, send, and manage electronic faxes within TRAKnet. TRAKnet is integrated with InterFAX to provide inbound and outbound electronic faxing services. After registering with InterFAX, you can enter your InterFAX credentials into TRAKnet through Tools > Options > Integration > InterFAX. In this screen, set 'Use InterFAX' to True, and enter in your User Name and Password. After entering your credentials, you may need to restart TRAKnet before can begin sending faxes. Whenever there are new and unsaved inbound faxes in TRAKnet, the Tools menu in the top-left corner of the screen will be highlighted in red. Inbound faxes can be viewed under Tools > InterFAX, which will also be highlighted in red and will list the number of unsaved inbound faxes. The InterFAX Inbound screen is divided into two sections: Unsaved Faxes, where inbound faxes can be seen before they're saved to TRAKnet, and Saved Faxes, where a record of previously saved faxes are kept. Unsaved and saved faxes can be viewed and printed by selecting the fax item. Caller # — The fax number that sent the fax. Pages — The number of pages faxed. Size In Bytes — The size of the fax file, listed in bytes. For reference, 1,024 bytes = 1 kilobyte, 1,024 kilobytes = 1 megabyte. Received — The date and time the fax was received by InterFAX. To save an inbound fax, select the fax item and click Save. A new screen will pop up that gives you the option to associate the fax with a patient and encounter, and to make a comment regarding the fax. When you are finished, click Save. If you associated the fax with a patient, you will be prompted to name the fax file and to save it in one of the patient's multimedia folders. If you also chose to associate the fax with an encounter, the fax can be viewed within the encounter as an attachment. If you did not associate the fax with a patient, you will be prompted to name the fax file and to save save it in the InterFAX folder, located within the network folder. All faxes, regardless of patient or encounter association, will be added to the Saved Faxes screen. Please note that any fax files that are not saved within the network folder (i.e. the location on the server where all multimedia is stored) may not be viewable within the Saved Faxes screen. Additionally, if a fax file is renamed or moved, it will also not be viewable in Saved Faxes. Please exercise caution when choosing to save, rename or move a fax file. 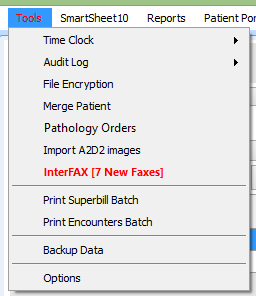 You can also delete faxes from the Unsaved Faxes screen by selecting the fax item and clicking Delete. Patient — The patient associated with the fax, if applicable. Encounter — The encounter associated with the fax, if applicable. Comments — Any comments that were made when the fax was originally saved. 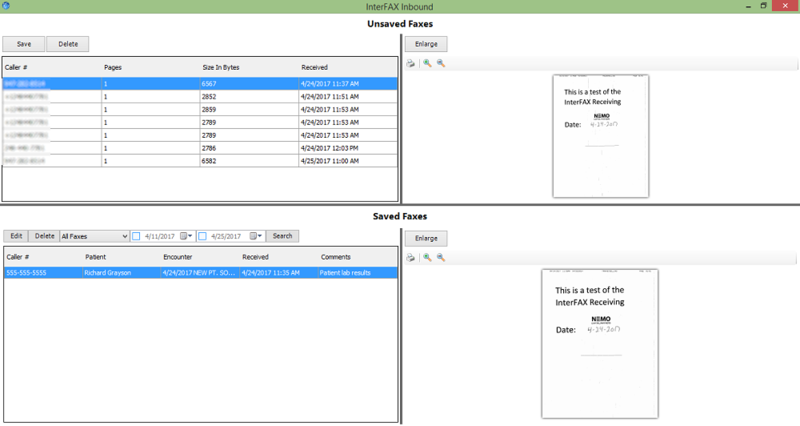 The fax items in Saved Faxes can be filtered by their association or lack thereof with a patient, by specific patients, and by date. You can also edit a fax by selecting the fax item and clicking Edit. This allows you to edit the comment and to change the patient or encounter associated with the fax. When you are finished, click Save, and you will be prompted to save the fax file in the applicable folder. Please note that if you do not overwrite the previous fax file, the previous file will not be removed from multimedia, which may cause you to have duplicate files in your multimedia folder. Certain screens in TRAKnet support the electronic faxing of documents; these screens include patient encounters, referrals and CCDA's to other providers. Whenever you send a fax, TRAKnet will prompt the user to choose a fax cover sheet. 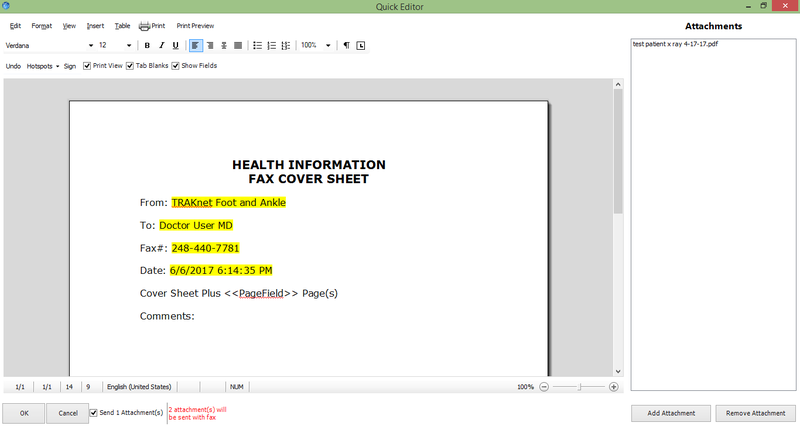 The default cover sheet and any new cover sheets can be found in Manage Templates, under the 'Fax Templates' template type. Upon being received, the PageField link, if used on the cover sheet, will display the number of pages sent, not including multimedia or other attachments. In addition, all faxes sent from TRAKnet will display the number of pages and attachments sent in the footer of the cover sheet. The steps explaining how to fax from each area of TRAKnet are listed below. Select the patient's Primary Care Physician or Referring Provider, if applicable, and click OK. Encounter notes faxed from Progress Notes, 2.0 Encounters, Referrals or Patient Engagement may also be sent with additional attachments. If the encounter selected to fax has a file attached to it, the encounter may be included by checking the box at the bottom of the screen. Additionally, files that aren't already attached to the encounter may be sent with the fax by clicking the Add Attachment button and selecting a file from either the patient multimedia or from a local or network file path. Any non-encounter attachments will be listed on the right side of the screen, and can be removed from the fax by selecting the item and clicking the Remove Attachment button. The total number of encounter and non-encounter attachments that will send with the fax are listed in red at the bottom of the screen.